Our Lacanche ranges are not just high-end appliances, they are authentic pieces of art for your kitchen. Hand-crafted by a team of skilled artisans in France, each Lacanche range is a testament to your distinctive taste of design and excellence. Available in gas or dual-fuel, and in a large selection of sizes and stunning colors, there is a Lacanche stove just for you! Discover our entire Collection and make your dream come true, or contact us for more information! 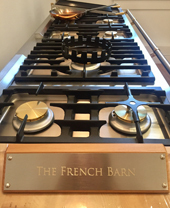 From the condo-size Cormatin to the 87" Sully 2200 Masterpiece, there is a Lacanche range for every kitchen! Bring some spice to your kitchen, with one of our 30 vibrant enamel colors! From the warmth of Brass to the shine of Chrome, each one of our 6 available trims is available to further customize your range. Each range is still hand-made in the factory established over 200 years ago, in the village of Lacanche, Burgundy, France. Experience the quality and workmanship of Lacanche in person! Design and configure your very own Lacanche range! Please note: our offices and Calgary showroom will be closed on July 14-28.